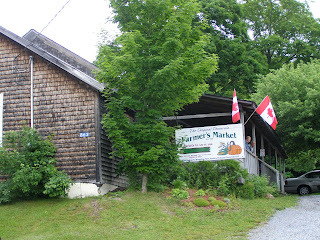 If you ever have the good fortune to visit my neck of the woods here in New Brunswick, Canada you need to go for breakfast at the market. The market is known by locals simply as that 'the market'. It refers to the Kingston Market on the Kingston Peninsula. There are 2 farmer's markets there, the old and new. The best breakfast is at the old. The eggs are fresh, the bread is homemade (as is the jam on the table). It's just wonderful, worth the drive and ferry ride in the morning. Certainly looks like the best breakfast ever. Love it! Oh man does that look good! Especially that raisin toast! Okey dokey then...I'm there (someday)!! After reading the Anne of Green Gable series in the last few weeks, I'm totally wanting to take our next family vacation to Canada! THat Farmer's market looks great! I have yet to get out east. The furthest I have been is Quebec, shameful, I know. Hubby was in Halifax and such in his youth in the armed forces and wants to do a road trip to visit all of the Maritimes one year. I have heard the eastern provinces are beautiful. The two gentlemen dinners look very pleased! A picture is worth a thousand words. Oh, I do love a good hearty breakfast. It's such a treat to have breakfast out, sometimes. 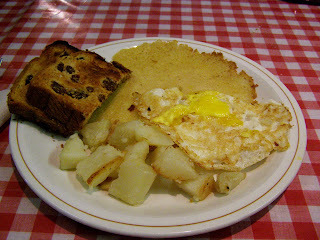 Is it really the best breakfast in New Brunswick? Oh, I don't know. Those pumpkin pancakes you introduced to me are pretty darned special in my book! 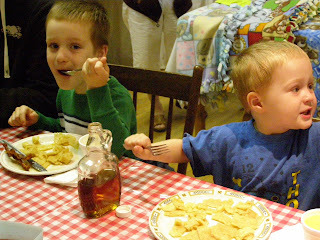 What a fun breakfast! Your kids are so cute! Love your blog...great recipes and other good stuff! Breakfast is my favorite meal and this looks delish!